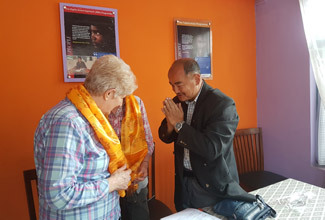 The founders of BNMT Ms. Gillian Kellie Stewart, Mr. Peter Hawksworth, Ms. Rosemary Boere and her husband Mr. Wim Boere visited Nepal on 09 March 2018. 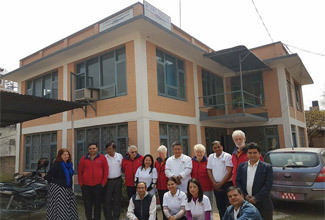 Ms. Stewart and Ms. Boere were one of the original nurses and Mr. Peter Hawksworth (as a technician) who came to Nepal in February 1968 and volunteered themselves for two to three years with virtually no reward apart from satisfaction of supplying desperately needed services to the people of Nepal. 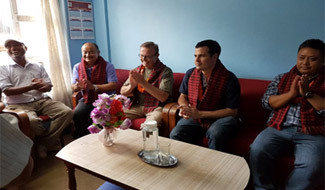 Their main objective of this visit was to be updated on BNMT’s current work and future plans but above all they wanted to visit Biratnagar, Dharan Dhankuta and up to Hile where they worked and established clinics fifty years ago, the hill drug schemes and Tuberculosis programmes and reminisce it. 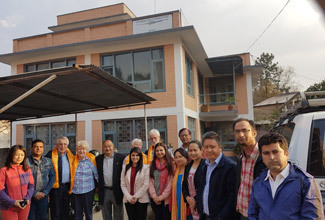 With great honour, BNMT Nepal’s director, Mr. Suman Chandra Gurung welcomed them and shared about organisation’s current projects, progress and future plans. 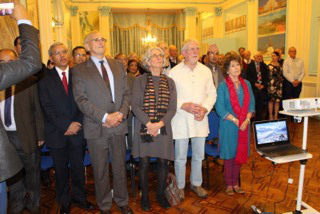 Similarly, they also shared briefly about their journey from United Kingdom to Nepal fifty years ago. 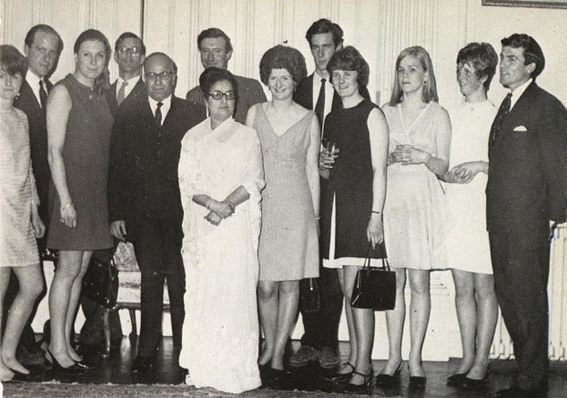 Finally, a group of photograph was taken with the founders along with BNMT staff. 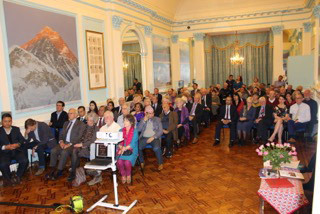 A celebration of the 50 year anniversary of the Trust was held at the Nepalese Embassy in London on 16th November 2017. 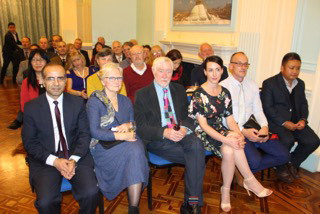 His Excellency the Ambassador, Dr Durga Bahadur Subedi, was the chief guest of the evening which was attended by over 70 supporters and ex Trust members. 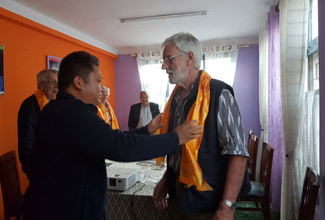 Dr Barney Rosedale – one of the original medical team – gave an excellent talk on the planning for the trip and setting up the health care programme in Biratnagar hospital in 1967 before extending the programme into the hills of the eastern region and the focus of the Trust on Tuberculosis. 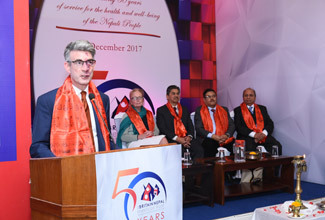 Dr Gillian Holdsworth (co-Chair of BNMT UK) provided an overview of 50 years of improving health in Nepal and the contribution which BNMT has made. 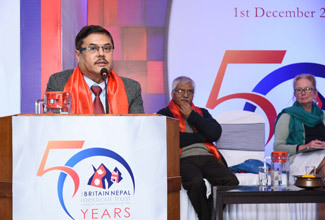 Dr Kulesh Thapa – Director of BNMT UK in Nepal, Mr Suman Gurung – Executive Director of BiratNMT and Mr Mahesh Sharma – Chairman on BiratNMT talked about the work of the Trust today and the establishment of and partnership with Birat Nepal Medical Trust and Professor Surya Subedi (co-Chair of BNMT UK) provided an excellent political analysis of Nepal today. 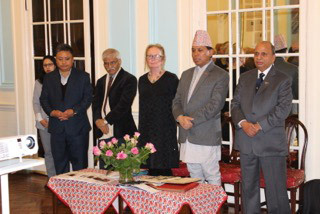 His Excellency Dr Durga Bahadur Subedi made a speech and presentations to Hannah, daughter of Dr Ian Baker, which she received on his behalf and Dr Raghav Dhital and Mr Mahesh Sharma. 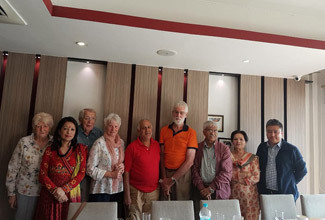 Finally – a photograph of six members of the original team of 11 who travelled overland in 1967 was taken with His Excellency the Ambassador. 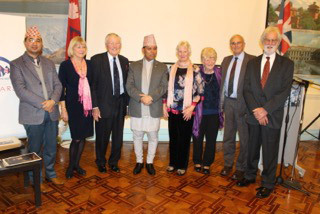 Mrs Di Chadwick SRN, Dr Vinton Chadwick, Dr Penny Cunningham, Dr J O B Rosedale, Nepal Ambassador, Ambassador’s wife, Dr John Cunningham (above) Rosemary Reid SRN,Peter Hawksworth, Gill Kelly SRN, Sheena Gordon SRN, Pru Hunt SRN, Mr J.P Ward. 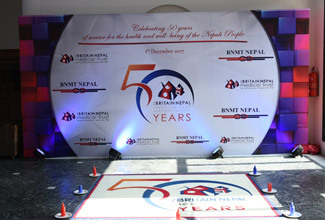 On 1st December 2017, BNMT Nepal celebrated 50 years of the Britain Nepal Medical Trust UK in Park Village Resort, Budhanilkantha. 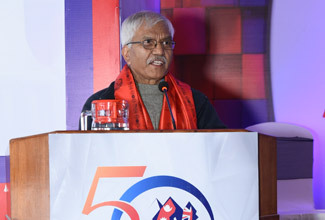 The 50th anniversary celebration program was held with the encouraging participation of distinguished representatives and stakeholders from the government, partner organizations, I/NGOs, BNMT Board andthe organizational staffs. 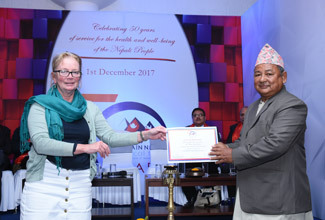 The program was chaired by Dr. Gillian Holdsworth, with Chief Guest Dr. Rajendra Pant, Director General, Department of Health Services; Special Guest, His Excellency Mr. Richard Morris, British Ambassador to Nepal and Dr. Binod Man Singh Shrestha, Health Ministry; and guests Dr. KedarNarsingh KC, NTC Director, Dr. Raghav Dhital, BNMT UK Trustee and Mr. Mahesh Sharma, BNMT Nepal Chairperson. 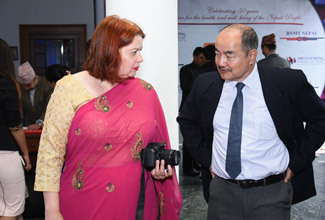 In this occasion, Health Link Talk Series VIII was organized where the speakers were Dr. Dirgh Singh Bam, Former Acting Secretary for Health and Population and Prof. Andrew Ramsay, Division of Infection and Global Health, University of St Andrews,Scotland, United Kingdom. 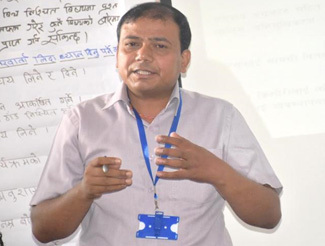 The speakers discussed on Success Story of Tuberculosis Control Programme in Nepal and BNMT and Tuberculosis: the global picture, WHO’s End TB Strategy and Nepal. 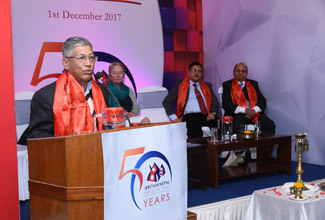 To mark the 50th Anniversary of Britain Nepal Medical Trust; Prof. Surya Subedi OBE QC along with his team completed our charity hike (walk) from the east coast of England all the way to the west coast along the ancient Hadrian Wall Path to support the Britain-Nepal Medical Trust. 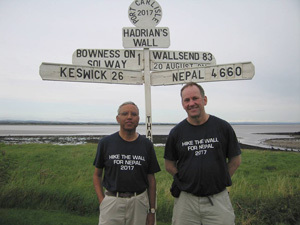 They completed the walk covering 96 miles (including short deviations for B&Bs) reaching a height of 1132 feet, passing 16 forts, 79 mile castles and 160 turrets over six days. 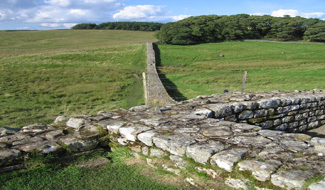 It was through craggy or rugged hills, slopes, and beautiful and dramatic parts of northern England. 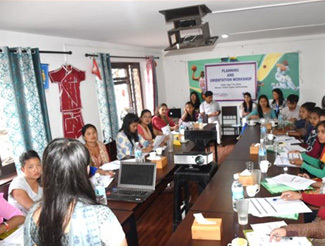 In Badegaon VDC of Sindhupalchowk, an interaction program was organized with Health Post Staffs, Health Facility Operation and Management Committee (HFOMC) members, community people and BNMT staffs. 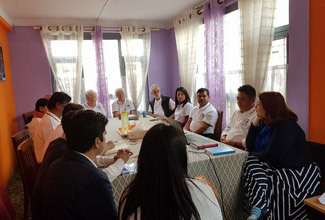 They enquired about the Mental Health and Psychosocial activities that were targeted for health workers, non-health workers and community people. 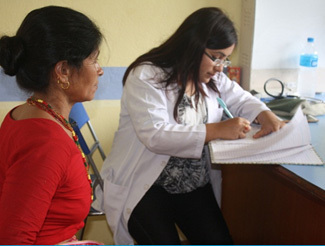 The donors also noted the good practices and challenges that arose during the program. 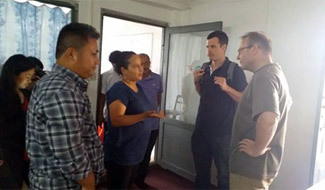 Similarly, in Bhaktapur, they visited the Urban Health Center and observed the MHPSS help desk and enquired about the mechanism of referral function of the desk. They also visited Basu Secondary School and made direct interaction with the students regarding Menstrual Hygiene Practices and its social issues including stigma and taboos. 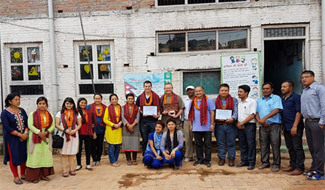 They observed the community toilet under-construction The WASH Committee of Bhaktapur Municipality and the community people interacted with the donor representatives and highly appreciated the work done by BNMT Nepal. 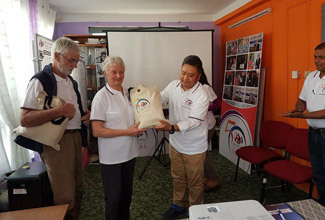 They also provided a token of love to the organization. 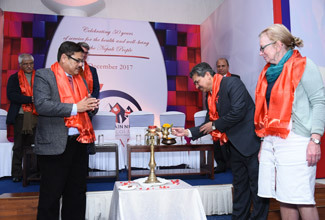 The Seventh Health Link Discussion Forum was held on January 02, 2017 at Hotel Shanri-La, Lazimpat, Kathmandu. 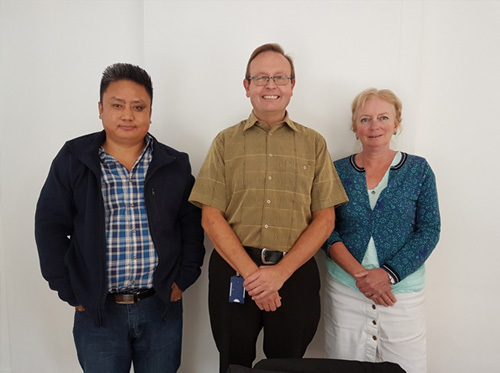 From September 15, 2016 to September 25, 2016 Dr. Kulesh Bahadur Thapa, Country Representative of BNMT UK and Mr. Suman Chandra Gurung , Executive Director of BNMT Nepal visited the United Kingdom to attend the Board of Trustee Meeting. 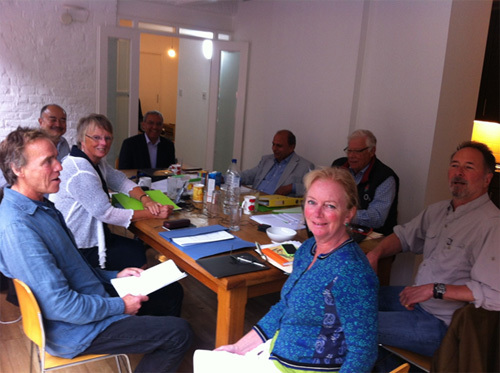 The Board of Trustee Meeting is held every twice a year. 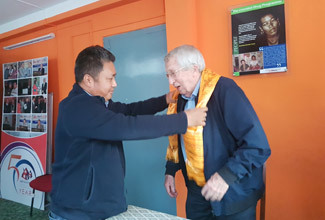 Dr. Kulesh Bahadur Thapa, Country Representative of BNMT UK and Mr. Suman Chandra Gurung, Executive Director of BNMT Nepal had a fruitful meeting with Mr. Phil Mole, Funding Officer (Investment) of Big Lottery Fund (BLF) in the United Kingdom. 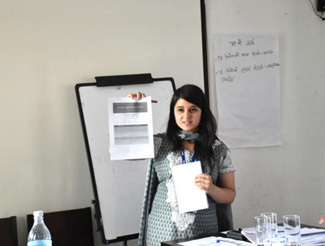 From September 7 to September 8, 2016 BNMT Nepal organized two day orientation for 19 participants facilitated by Consultant Ms. Nilu Thapa with the purpose of generating familiarity with the baseline survey to the participants and providing detail information about the activities of baseline survey and the intervention as a whole. 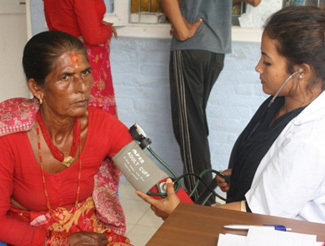 On September 6, 2016 a free health camp was organised by BNMT Nepal in Sindhupalchowk District as one of the main activities of Big Lottery Fund (BLF). 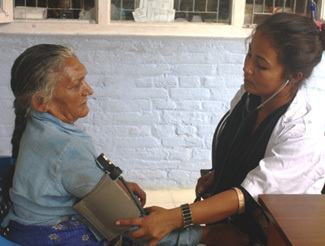 Indrawati Community Service Centre provided three rooms for diagnostics (Orthopaedics; Paediatrics; and Obstetrics and Gynaecology) and one for distribution of free essential medicines, provided by BNMT. 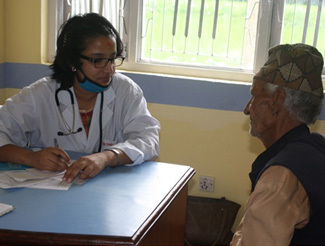 Total 125 people of all ages, with 60 women, 40 men and 25 children, were directly benefitted from the camp. 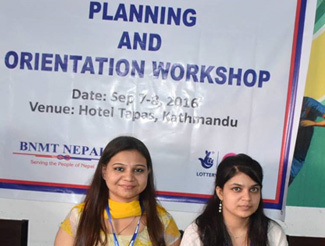 BNMT Nepal expresses their sincere gratitude to Dr. Komal Bikram Thapa, Dr. Kulesh Thapa, Dr. Smriti Pant and Dr. Sadesha Khadka along with several volunteers for their active participation and support in conduction of this camp. 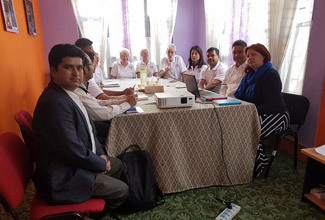 Projects to help with the long term rebuilding of communities devastated by the earthquake in Nepal are being announced by the Big Lottery Fund today. 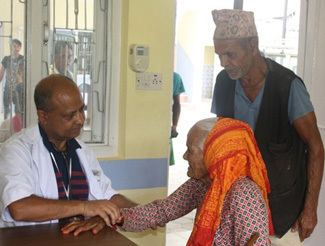 A 7.8 magnitude earthquake struck Nepal on 25 April 2015, followed a year ago today by a massive aftershock measuring 7.3. 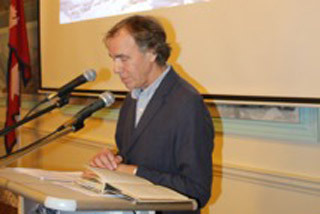 The disaster left around 8,700 people dead, 22,000 injured and hundreds of thousands homeless. 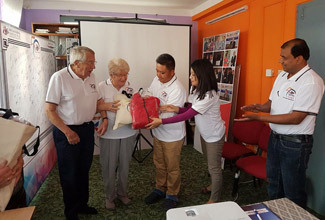 The Big Lottery Fund committed a total of £2 million in May 2015 to help affected communities and after discussions with several agencies including the Disasters Emergency Committee it was agreed it would support the ongoing rehabilitation work beyond the immediate disaster relief phase. 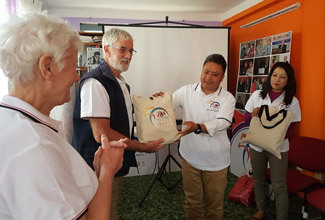 The first five grants are being made to UK-based charities PHASE Worldwide, Global Action Nepal, Doctors of the World, Britain Nepal Medical Trust and Global Giving UK. 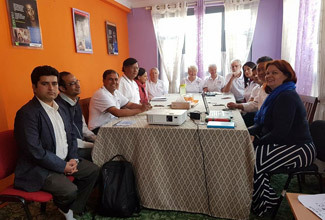 Each project is based on consultations, surveys and focus groups in the targeted communities and been adapted according to their feedback on their needs.